Email list is a great way to market your products and services to a group of people who have done registration and they are existing customers or warm leads you have come in contact with. Email marketing is very effective because it allows you to communicate with your market consistently and at a low-cost. Therefore, your inexpensive email can help you generate consistent revenue for your business. Return on your investment: For a small investment of time and capital, you receive a return that exceeds your initial costs. Immediate results: Within your email, you are asking for an immediate response to your call-to-action which has to be answered within a designated timeframe. Global reach by getting registration: You are able to connect with people who have internet access, no matter their location in the world. Shareable information: If your email subscribers particularly like the information you are sending, they can share it with their family and friends who are not on your list. Track results: Email marketing software allows you to track open rates, click-through rates, and conversion rates. This allows you to understand how you can improve your designs and messages. Easy to create: Content is the most important part of your email, and it can be enhanced with videos, images, your logo, and a good template. Customer segmentation: You can set your emails to be sent to people based on their preferences, this way you are only communicating with hot targets. Target your fans: If a person opted-in to your email list, this means they want to be able to know about the latest company updates and offers. Only send emails to people who have expressed this interest. Low-cost: The most money you will be paying is for software to manage your email database and email marketing campaigns. As you can see, email marketing provides great benefits at a low cost for an exponential return. What you need to do is find out how you will get people to sign up for your email list. You do not just magically gain a list of 25,000 subscribers without doing a little work. If you want to build an email list that provides you with a great source of revenue, do the following tasks to produce the desired results. Your email sign-up sheet needs to be in front of people so that they can write their information down to subscribe. This should be done at networking events, trade shows, and at your company events. This allows you to follow up with the attendees of these events so you can keep them aware of updates within your company. You are able to create new fans for your company, giving you the chance to convert these people into customers. Business cards usually have someone’s email information on them. Therefore, you need to take inventory of the cards you receive by placing them in your email database. You should send an email first asking people do they want to be included on your email list. This way you do not annoy someone who is not a fan of being subscribed to the email list without their permission. You will also want to have a bowl in your office where people can drop their business cards into. Let them know by doing so, they are opting into your email list. Host events that are focused on bringing your target market to your business. You can invite people by going to local businesses, going to local networking events, and messaging them through social media. Require for people to rsvp with their email address to attend your event. Offer an exclusive group that is for only certain people. This tends to increase people’s interest about what type of information is being provided in this exclusive group. What you want to focus on is the exclusivity of the group and how only certain people are given access to its value. If people would like to learn more, they will need to provide their email address. Give people the opportunity to win a reward for entering their email for your special offer. It is a win-win exchange. They are excited about the possibility of winning the prize, and you are excited you have their email address. If you receive a business card that has no email information but has the person’s address, send them mail directly. You should let them know you have special offers that can only be accessed by signing up to your email list. You have to do phone calls to make sales, so why not try to enroll people to your email list while you have them on the phone? Communicate that your email list subscribers receive discounts and special offers that are not given anywhere else. This helps your sale on two fronts instead of focusing on just phone calls. A person who lands on your website is most likely interested in your products and services. Therefore, your email opt-in needs to be included on all your pages so they can constantly be reminded to sign-up. It is especially important to have this sign-up option available on your product and service page. Blogging and email list go hand-and-hand. You should have a call-to-action after each post telling people to subscribe to your email list to receive more valuable content. Also, if people want to leave comments, they should be required to give their email information. This should be easy to do if people have read your content all the way through. This means they like the information you provide and would like to receive more. Social media is a great way to speak to people directly about things that interest them. Target people who are interested in the types of products and services you offer, and let them know about the great information that is provided via your communication through email. Sometimes people update their emails, so the one you have is no longer correct. That does not mean you give up on making contact with that person. If you have their social media information, phone number, or mailing address; you can reach out to them through these channels. Let them know about all the great information they are missing out on that is within your emails. Ask them if they would like to subscribe to you email list again. Partner up with another business and share each other’s efforts on your separate blogs, marketing campaigns, and newsletters. You both should be sharing the other’s email list so that it is getting exposure. Your blog or website needs to be setup to remind visitors to subscribe to your email list. When visitors are scrolling down your website, a pop-up box needs to appear reminding them about your email list. This should also occur as they are leaving your blog, you want the reminders to be constant but not a nuisance, this will drive people away for good. Creating an online community gives you the opportunity to allow people to grow with your business. The key for this to be successful is allowing your users to run this community, without your constant intrusion. Your community will grow as a result and be more authentic. You need to reward the subscribers to your email list. Offer them great deals that you know your existing customers or people in your target market would love to have. Encourage your email subscribers to forward these deals to their family and friends so they will be compelled to become an email subscriber. The option to opt into your email list should be available in your email signature. When you send emails to existing customers and prospects, this should be bolded and give a brief reason why subscribing to your list would be valuable. When people purchase from your business through Foursquare, reward them for using the financial platform. You need to tell them to check-in to your business when the purchase is made for this to happen. This act helps them promote your business to other people so they become interested in what was purchased from your business. The people who promote your business the best need to be rewarded for their efforts, by being offered specials and discounts via their email. Blog commenting and forum commenting are great ways to pull people to your website. You will need to add valuable commentary in order for this work. If you provide insight of an expert, people will want to learn more about your business. Your employees need to communicate the value of subscribing to your email list when following up with customers. Make special offers such as a percentage off for their services or bundled packages of products and services at a special price. Customers love getting deals because it makes them feel like they are saving money. Offer your customers daily deals each day that can only be obtained by being an email subscriber. You can communicate this through email, phone calls, direct mail, and social media. Encourage your customers to be cheerleaders for your email list. They should be letting people they know who have a need for your products or services about your business. Offer them rewards for successfully referring a new subscriber to your email list. Every time you send an email to your subscribers, there needs to be a call-to-action encouraging them to forward that email to someone, not on your email list. 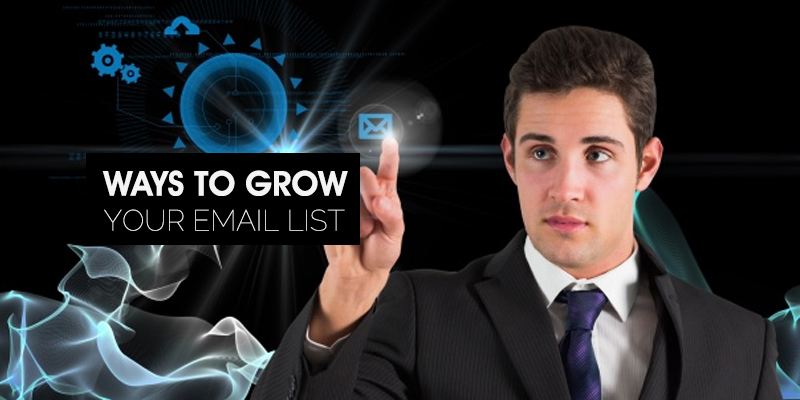 This will help to grow your list exponentially without you having to do the work yourself. Your receipts should not only show the transaction that occurred. It should also show people special offers they can take advantage of. This needs to include subscribing to your email list. Let people know they can take advantage of deals by being an email subscriber. When a large amount of your local community is out and about for a street fair or community event, you need to be present and ready to collect names and emails. Hand out brochures with your email subscription option. Also, set up a table and have people sign up as they come up to your table to learn about your business. Let your customers know you will reward those who promote your business through videos and social media. They need to use these social media platforms as a way to drive people to your business. You need to encourage the public to participate in the competition. Public participation should be encouraged to use their email address to cast their vote. Your smartphone is a powerful device that can be used to handle practically all of your business needs. This includes having people subscribe to your email list. If you do not want to rely on paper and pen, you can simply pull out your phone and allow the person you met to enter their information into your subscription box. When you ship products to your customers, you will want to include your email subscription information in the package. You want to offer something like a rebate or promotional offer if the customer chooses to sign up to your email list. They should enter the receipt number when they are subscribing to your email list. When you send your invoices out, you will want to have an offer attached to the invoice that promotes special deals and offers on their next purchase if they become an email subscriber. This will help to grow your list and drive more revenue into your business. Your email sign up needs to be promoted on your email signatures, social media descriptions, article bylines, and YouTube videos. When you join your Chamber of Commerce or local business groups, email these members and let them know about your email list. You want to provide encouragement with special offers made to those who are in these groups who subscribe to your email list. When you are offering a free ebook or guide, these should only be received by entering their email address into the download box. This is a win-win, because the subscriber is getting value, while you are placing someone within your sales funnel. Speaking engagements are a great way to sell yourself to hundreds or thousands of people at one time. After giving a dynamic speech, you want to let people know how they can find further information by visiting your website and through your newsletter. Of course, all this can only be gained with an email subscription. Every month you need to give your email subscribers great deals for being signing up to your email list. This encourages them to remain on your list and promote it to their family and friends. Customers are more willing to purchase when they are among an exclusive group. You need to give your email list subscribers something special that only they have the benefit of receiving. An email only discount would be a great offer. You could also provide a members-only video, a free ebook or webinar. It should be communicated to others that these offers can only be had by joining your email list. People feel like they are getting the best options when they are provided with more choices. You will need to create email levels that allow people to subscribe to the options that are favorable to their needs. Also provide the option of customization with the ability to control the level of email content distributed to them. When you give people more control, they are more willing to become a subscriber of your email list. Take advantage of adding a QR code to your printed marketing materials, such as ads and your material sent through direct mail. The purpose of the code is to have people scan it, which allows them to sign-up for your email list. Make your email subscription more compelling by including the verification of existing email subscribers expressing the value they are receiving from your email content. This will provide validation about the quality of your email list from people other than yourself. When you have knowledge about a certain industry, position yourself as an expert who has authority insight. This will help to identify you as an authority, which gives you a competitive advantage. Therefore, it would be wise to show people your expertise through an online course or webinar, that is only accessible through your email list. Just because you have your email sign-up box at the top of your website, it does not mean visitors see the box. This is why you need to utilize both a pop-up box and scroll box that appear when visitors move along your page. These are great tools to use because they can be set to appear after a certain length of time, which helps when people are actually reading your content and staying longer on your website. An email list is a great way to sell more products and services to existing customers and prospects. You want to grow this list so that you have a sure way to have revenue flowing into your business. By offering specials and discounts, you make money from your email list, without having to invest a lot into making the effort profitable. So do not skip on having an email list and constantly working to grow its subscribers. This list can be the marketing tool that brings tons of money into your business. Rikvin, Singapore’s leading one-stop Singapore corporate service provider, offer a range of corporate services to ensure that your statutory compliance requirements are met.